This is a beautiful ornamental afghan with around 50 colorful motifs. The more, the merrier. This is one of those designs that allows you to run wild with colors. Instead of looking garish, the more colors you use, the more unique and attractive your blanket will be. More than that, this beautiful pattern will be a great challenge for beginners to up their game, but also interesting enough to keep the advanced ones occupied. A link to the free pattern is below. Christmas Boho Ornament Afghan – here is a Part 1 of a free pattern. 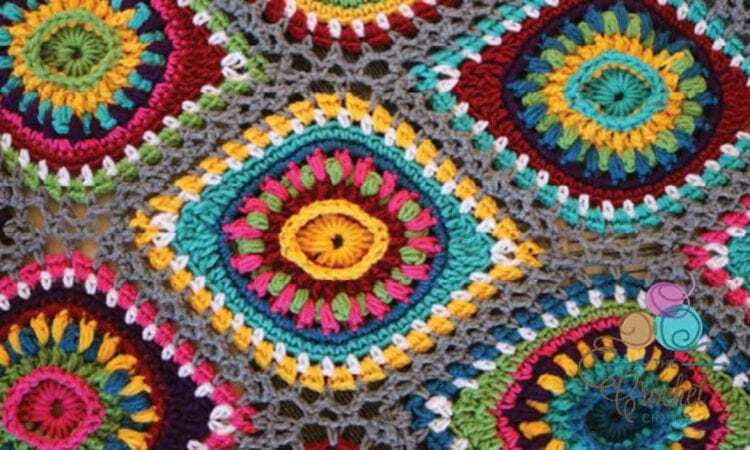 For the rest of the pattern, you have to access Boho Ornament Afghan Clues event at Facebook here. More info about it at a pattern site. or at Ravelry.